Book this presentation (E, D, F) contact me for further details. Workshop with Points of You® for people operating in developing countries. The aim is to improve communication and to better understand the daily issues of your local team. 6th graders from Buchs managed to raise the amazing sum of CHF 4'350.80 by selling their booklets - BRAVO!!! We have analysed the "17 Sustainable Development Goals" of the Agenda 30 at our Campus "Tala Mosika"
Our center "Tala Mosika" in DR Congo is powered by River of Hope! 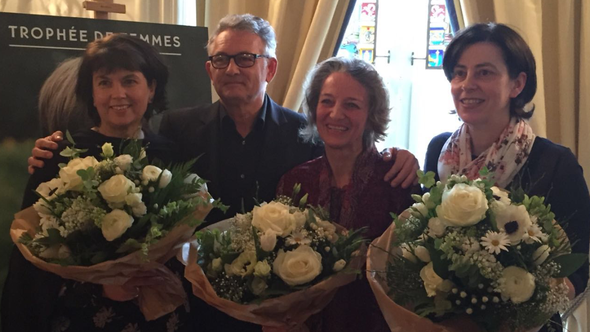 NUR NOCH EIN PAAR TAGE "Donate now / Spenden Sie jetzt"
"Yves Rocher Foundation" awarded Claudia Doron on 12 February, with the national environmental prize "Trophée des Femmes" Switzerland 2016. Claudia was awarded with the 2nd price for her exceptional dedication and relentless efforts in Congo. St.Georges has decided to plan activities this year and support our project with it. Die Oberstufe Eglisau hat sich für unser Projekt entschieden und wir am Osterlauf Geld für uns sammeln DANKE & viel Spass! Empower the local team through coaching, so they can be in charge, take over responsibility for the center. This is the basis for a sustainable project. Building another 2 classrooms for total 30'000.- incl. furnitures. Partner (50%) for our solar project, ask for details. Support our medical center, so we can offer medical care to the kids. Support our kitchen so we can offer 1 meal a day to our school children. Support our educational center so we do not have to reject children who can't pay the school fees or get a uniform.